Jenny Lake is considered the most romantic and beautiful Grand Teton National Park feature. According to a ranking, boating on the crystal surface of this basin is one of the most romantic places to propose marriage. The uniqueness of this beautiful scenery is complemented by an environmental view, composed of majestic mountain peaks. 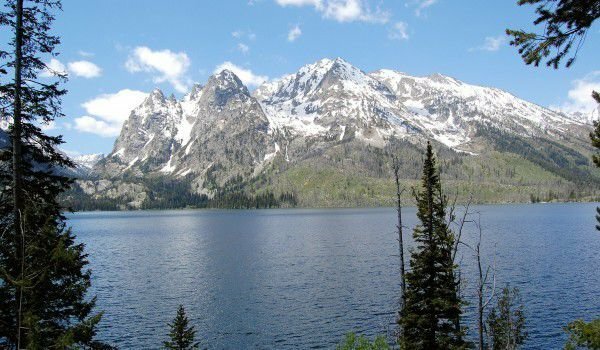 Jenny is a major emphasis among the natural attractions of the Grand Teton, which leads to numerous hiking trails and boating opportunities. In addition, Jenny provides quick access to conquer the mountain peaks of the main Teton Range. Formed by melting glaciers 6000 to 12, 000 years ago, Jenny Lake is an incredibly beautiful and romantic mountain lake with clear blue waters within the park. It underlies the Teewinot Mountain, its west coast touches the majestic Teton mountain range. Jenny’s dimensions are limited to a maximum length of 3.5 km, maximum width of 1.9 km. This natural water basin occupies an area of 1 sq. km. Jenny was formed at an altitude of 2067 m and its maximum depth is measured at 79 meters. The main tributary is Cascade Creek, and drainage is performed by Cottonwood Creek. The hiking Trail, which circles the entire lake, is more than 10 km long. In the visitor center, Lake Jenny has a large parking lot where you can leave your car. From this point you can choose to indulge in hiking or rent a boat to get to the other shore of the lake. Because of his great popularity, the tourist flow in the region is strong and quite often people have had to wait for a free boat. Typically, visitors head to the Cascade River canyon with the route to two of the most beautiful places near Jenny - Inspiration Point and Hidden Falls. Inspiration Point is a viewing platform, which can be reached via the path Cascade Canyon Trail, around a kilometer from the shore of Jenny. From there is an unbelievable view of the highest point in the Park, the peaks Owen, St. John and the picturesque Cascade canyon. En route, pass through the Hidden Falls. Jenny Lake Lodge is a tourist base on Lake Jenny, where visitors can find all necessary amenities. There is also an excellent restaurant to eat but it requires a reservation. If you visit Jenny Lake in the summer, July and August, do not forget to bring your swimsuit and because a quick immersion in cold water can be quite refreshing. From Jenny, with a 15 minutes drive north, Lake Jackson can be reached. Roads to Jenny are often closed during the winter months.